What a brilliant, quick little recipe this one is! Perfect for a mid week lunch or a noodley accompaniment to your choice of protein at dinner time. Cook the noodles in water, strain and let cool. Blend all other ingredients until smooth and mix in with the noodles. I found this recipe on Mind Body Green visit their site to see the other avocado recipe suggestions provided! Let me know if you give this a go. I mentioned recently that I’m a little bit of a workaholic….guilty as charged. I do tend to work late and sometimes dinner time is a little bit rushed or I realise the pickings are a little on the slim side when thinking about what I’ll whip up for tea. I love it when a fridge surprise just works. 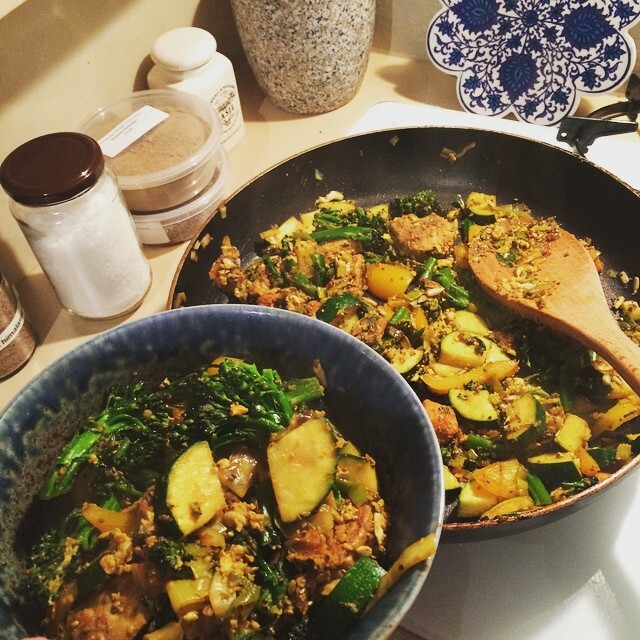 You grab a bunch of random ingredients, throw them in some coconut oil and voila! Dinner is served. Wednesday night was one such night, did you see it on my insta? Fry this all off and add the egg and seeds right at the end. You could serve this with quinoa or rice too if you like. There are absolutely no rules with fridge surprises and I love learning about new combos that just work. Comment below if you have a good one! Did you know that you share your body with about 100 trillion microbes? Sounds creepy right! They co-inhabit your skin’s surface, your mouth and also love a little gastrointestinal hang out! Our microbiome is completely unique to each and every one of us. So why do we have all these extra little, friendly (and sometimes unfriendly!) critters along for the ride? Yes, they play a role in digestion, namely going to work on the foods that otherwise would be indigestible. They’re also critical in the production of a a couple of important vitamins – B and K in particular. They are also inextricably linked with our immune system and overall health – have you heard that whimsical musing…the gut is our second brain? I’ll definitely be posting more about the gut-brain-health connection so if this interests you, follow along! 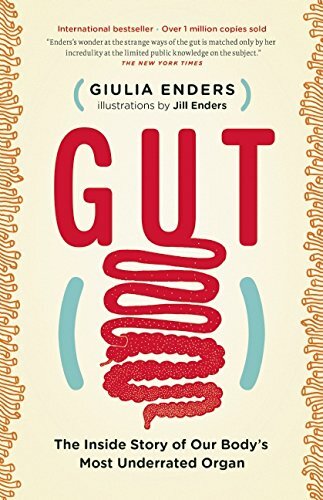 There’s a book on my ‘to read’ pile called ‘Gut’ by Giulia Enders, a microbiologist and gut enthusiast. Let me know if you’ve read it! Enjoy your fruit and veg and give fermented foods (microbiome boosters!) a go. The sauerkraut pictured above is beetroot and purple carrot – feel free to mix it up and change the veg around based on what you have in the fridge. Finely slice or grate your veg – a few beetroots and carrots will do! You could also use a head of red cabbage. Massage about a tablespoon of sea salt through the veg until it softens. Pack the veg into a large jar and tamp down so that it sits below the level of liquid. Press down at regular intervals throughout the first 24 hours. You can add a little water/salt combo (1tsp salt to 1C water) if required as if anything sits out of the water it may go a little yucky. Cover the jar with a piece of chux or cheesecloth and secure with a rubber band. Leave the jar on the bench for 3-5 or so days (longer if desired!) depending on the time of year/temperature. 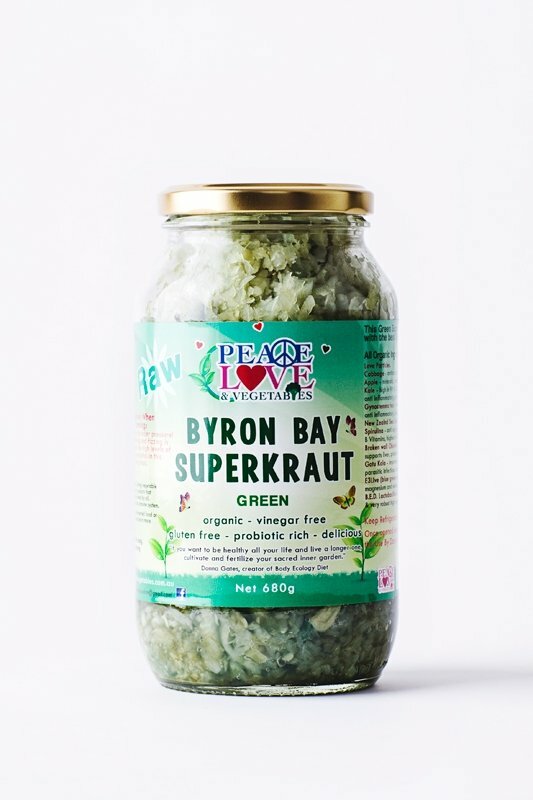 If you’d prefer to buy it, I’ve tried this one – Byron bay Sauerkraut. The first ingredient is little particles of love…how could you go wrong? Let me know how you go with your little probiotic jar of goodness! Hanifa on Any-fruit, any-nut crumble! Hi friends 👋🏼 @mekaila and I have gone through our cupboards, found a few bags we don’t use anymore, purchased a few items and we’re nearly ready to drop these bags off to be gifted to some lovely women this Christmas that need them. It’s a really simple gesture that you can get involved with too! Can you add a couple of items to your shopping list week to help out? #itsinthebag #donationsneeded #sharethedignity @sharethedignityaustralia thanks @courtsmiller13 for the inspiration!! Click here to visit I Quit Sugar.